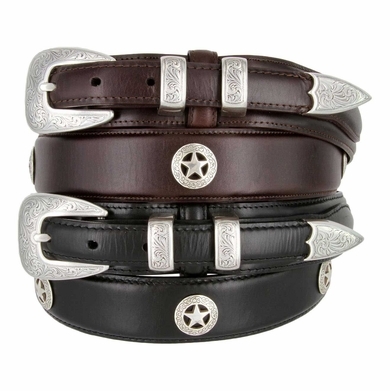 The Finest Oil Tanned Cowhide Leather accented with sterling silver Buckle set and 5 Ranger Star Conchos. 4 piece 3/4" buckle set. The belt is 1 3/8" wide Tapering to 3/4" at the buckle and tip ends. Questions? Comments? Prefer to order over the phone? Call us toll-free at 1-888-692-3587.